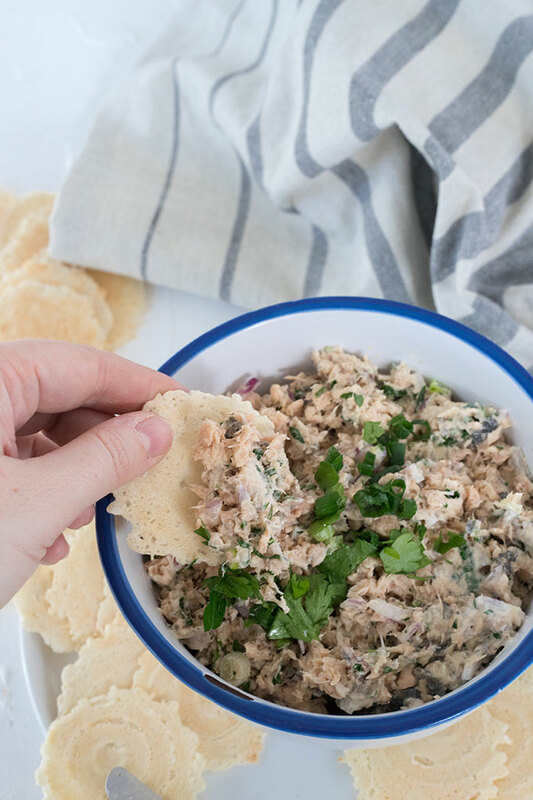 This salmon dip is undoubtedly the easiest and quickest dip you can make! 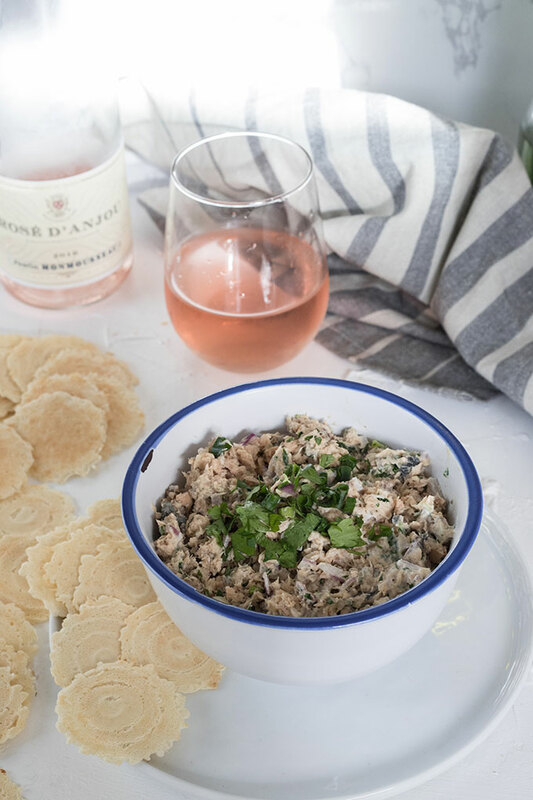 A fresh and flavourful dip made with canned salmon, this quick salmon dip is perfect for a party celebration or special occasions with friends! Great for picnics, Christmas, Easter, wedding or baby showers or if you need a quick dip to take around to friends for game day! Salmon! My favorite fish! 5-minute salmon dip! My favorite dip! This dip is so easy, it literally takes about 5 minutes to make. It’s kind of a cheats dip, considering you buy a can of salmon from the supermarket to use, and use other store-bought ingredients, but I am so down with food that is quick and flavorful that I’ll let that one slip! I always have a tin of salmon in the pantry just in case we have friends over and I need something to make quickly. All you gotta do is chop the onions and parsley and mash everything together with mayonnaise! Oh and season and garnish! Too easy! I remember vividly when this post went live last year (I’ve been doing some content updates!). We had some friends over as ‘guinea pigs’ for recipe testing and I made this salmon dip and a disastrous gnocchi! I made the regrettable decision to make sweet potato ricotta gnocchi from scratch, thinking it would be a great recipe for the blog. It wasn’t. It was everything short of a disaster and needless to say I haven’t attempted it again. Seriously, people, gnocchi is HARD to make! And other bloggers make it look so easy. So in light of the disastrous gnocchi attempt, something pure and beautiful did come out of that dinner – this 5-minute salmon dip, and my beautiful lemon and coconut tart. This salmon dip is seriously so easy to make, anyone can do it. It also utilises simple ingredients found in supermarkets in the States and in Australia. We’ve actually been making it for years and years, it was a recipe that one of our neighbours gave us when I was back in High School! You know a good recipe when you’ve been making it for that long! The key to making this dip exceptional is the way you dice the onions. Let’s face it, no one like onion over empowerment, which is why you need to dice it as finely as possible. Here’s a link to a YouTube video to assist you with onion chopping. You will need to cut across to the back of the onion about 3 – 4 times to make sure it is diced small enough. Fun fact of the day – Adam (hubby) used to work in a restaurant and has ace knife skills. Me, not so much. I drop knives dangerously close to my feet… a lot. You will also need to ensure the green onion/spring onion is diced very finely as well, I’m talking about like 2-3mm/0.11inch (if that is even possible to gauge in inches?). The finer the dice, the better it will taste. There is nothing worse with this dip than having huge chunks of stinky onion, and frankly, at a dinner party, no one wants smelly onion breath! This recipe also requires adjusting the salt, pepper, and mayonnaise to taste. I used 1/3 cup of mayo but you might need to add more depending on individual taste. Also, American cup sizes are slightly different to Australia’s, but I haven’t quite figured that one out just yet! As all of my recipes, salt and pepper are added to taste. How much salt you add totally depends on how salty your salmon is, so ALWAYS KEEP TASTING and adjusting as you go! Sorry, didn’t mean to be yelly, just wanted to reinforce how important it is to always taste your food! If there is anything I’ve learned from watching Australian reality cooking TV shows, is the essence of tasting as you go! And remember, you can always add more salt and pepper, but you can’t take it away! Aside from that, this salmon dip literally takes about 5 minutes to make. Serve with bagel crisps or water crackers/wafers and you’ve got yourself the perfect dinner party entree! 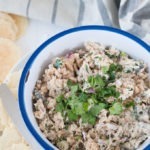 This canned salmon dip is a fantastic party appetizer. This is a super easy recipe, that is budget friendly and take just under 5 minutes to be on the table! A creamy dip, bursting with fresh flavours. 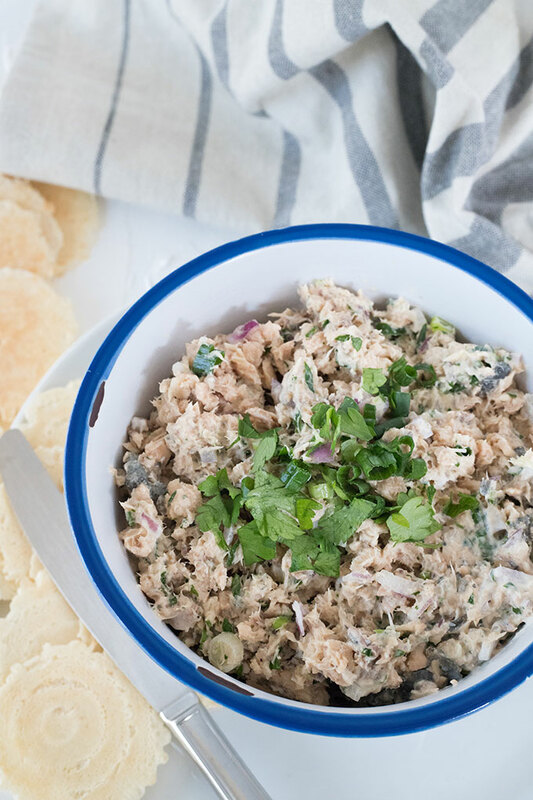 This dip is an absolute hit in our family, and if you love salmon, then this dip is for you! Drain salmon and place in a large bowl (bones and all). Mash with a fork until large chunks of meat and bone have been broken up. Add mayonnaise, and salt and pepper. Stir until well combined, adjust salt, pepper and mayo to taste. 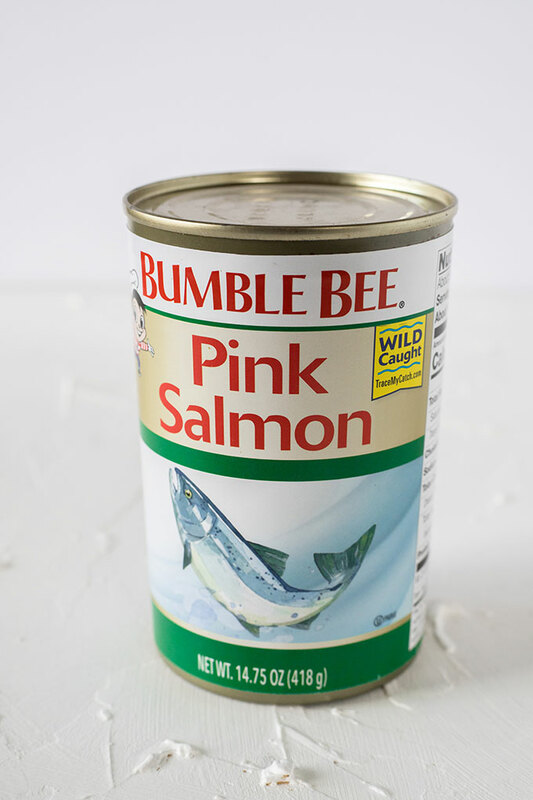 note 1 - in America I used Bumblebee brand pink salmon and easily found it in supermarkets. In Australia, John West do either a pink or red salmon. I've used both, and they are both great. I do believe pink salmon is cheaper, however! note 2 - this is really hard to gauge in grams or ounces if it helps it's just slightly under a quarter of an onion. note 3 - it doesn't make a difference if you use flat leaf or curly parsley! 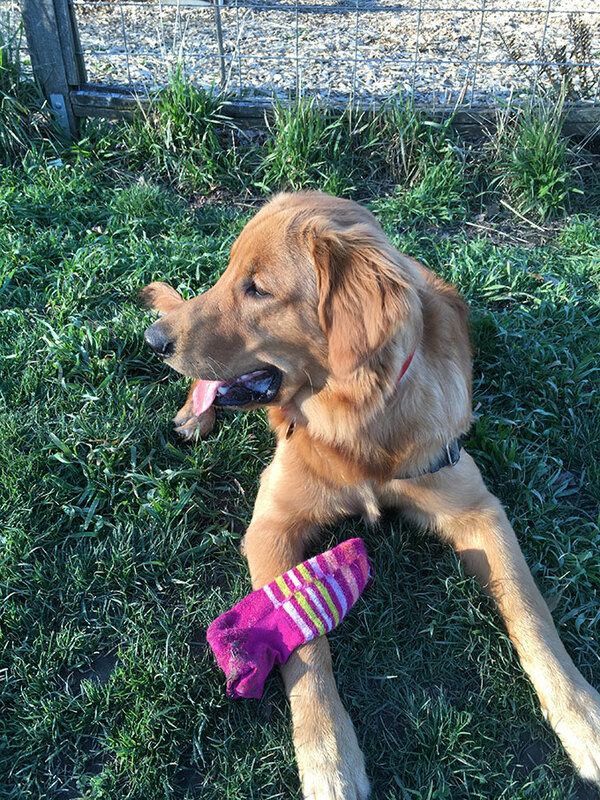 Went to the park, found socks. If there was a dog that was going to sniff out a sock, it would be Archie! I never think of making a dip with salmon, this is delicious and great tips too. thanks Janette! it’s SO easy and so delicious, family favourite! This looks like the perfect Easter appetizer! Thanks for the great recipe. thanks Susie 🙂 it is a staple for entertaining in our family! you definitely can’t go wrong with a 5 minute meal! So easy! Love easy dips and appetizers! it is the easiest dip i know how to make! love quick recipes too! I actually have a can of salmon in my pantry right now. It has been in there for months. I need to make this and get it out of the pantry! having canned salmon in the pantry is a must for me! this dip is honestly so tasty, and you won’t believe it’s made with can fish!